Headed to fill the International Space Station's docking port vacated by Europe's now-departed Johannes Kepler freighter, Russia today launched another of its resupply ships. Liftoff of the Soyuz booster carrying the Progress vessel from the Baikonur Cosmodrome in Kazakhstan occurred at 10:38 a.m. EDT (1438 GMT), beginning Russia's 43rd such cargo delivery mission to the space station. A series of precise engine firings over the next two days will guide the Progress toward an automated rendezvous with the station for docking Thursday at 12:37 p.m. EDT (1637 GMT). The 24-foot long ship will attach itself to the open port on the Zvezda service module on the backside of the station, which became available Monday when the European Space Agency's Automated Transfer Vehicle was jettisoned to burn up in the atmosphere. Today's launch was known in the station's assembly matrix as Progress mission 43P. 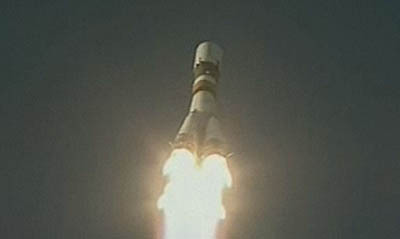 The spacecraft's formal Russian designation is Progress M-11M. The craft will bring two-and-a-half tons of supplies to the station. The "dry" cargo tucked aboard the Progress amounts to 4,200 pounds in the form of food, spare parts, life support gear and experiment hardware. The refueling module carries 1,100 pounds of propellant for transfer into the Russian segment of the complex to feed the station's maneuvering thrusters. The vessel also has 110 pounds of oxygen and air. It'll remain attached to the station through the end of August. The space station is staffed by the Expedition 28 crew of commander Andrey Borisenko, cosmonauts Alexander Samokutyaev and Sergei Volkov, American astronauts Ron Garan and Mike Fossum, and Japanese astronaut Satoshi Furukawa. The cosmonauts will be standing by Thursday to take over manual control of the approaching Progress spacecraft if the autopilot experiences a problem. They will spend time this week checking out the backup system. Orbit Insertion 0/00:08:45 10:47:00 a.m.
(36.89 m/s) 0/03:40:33 2:18:48 p.m.
(18.81 m/s) 0/04:29:50 3:08:05 p.m.
(2.00 m/s) 1/01:17:53 11:56:08 a.m.
(17.110 m/s) 2/00:00:02 10:38:17 a.m.
(1.274 m/s) 2/00:22:03 11:00:18 a.m.
(15.346 m/s) 2/00:47:03 11:25:18 a.m.
(Range 80 km) 2/00:48:53 11:27:08 a.m.
Orbital sunrise 2/01:01:23 10:39:38 a.m.
(Range 15 km) 2/01:10:13 11:48:28 a.m.
(Range 9 km) 2/01:16:13 11:54:28 a.m.
(Range 8 km) 2/01:17:33 11:55:48 a.m.
(Range 3 km) 2/01:25:33 12:03:48 p.m.
(6.452 m/s) 2/01:26:16 12:04:31 p.m.
(Range 2 km) 2/01:28:13 12:06:28 p.m.
(5.610 m/s) 2/01:30:57 12:09:12 p.m.
(1.952 m/s) 2/01:33:45 12:12:00 p.m.
Start flyaround 2/01:36:48 12:15:03 p.m.
Start stationkeeping 2/01:43:45 12:22:00 p.m.
Start final approach 2/01:47:45 12:26:00 p.m.